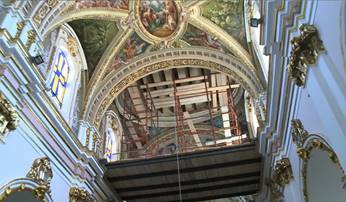 Part of the ceiling of the Ta' Giezu Church in Rabat collapsed during the night of the 23rd of August of this year. Fortunately, nobody was inside the church at the time. Fr Martin Coleiro, the prior of the Franciscan Fathers who run the church believes the wooden beams must have given way some time during the night. The accident was noticed in the morning when the church, one of the oldest in Malta, was opened for Mass. The Church is used frequently by the Order of Saint Lazarus for its services and other solemn events. Most of the debris ended up on the altar. Coleiro went to open the church for mass at about 6am to make the grim discovery. Coleiro said "thank God" the accident happened during the night because otherwise it would have been a worse incident as the altar and church is often filled with people. 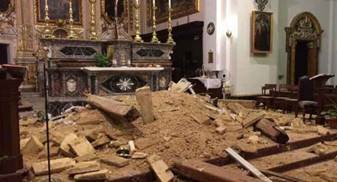 The damage caused to the ceiling as well as the altar below runs into hundreds of thousands of euros. Coleiro, still visibly under shock, explained that the church underwent restoration work over the years. The last restoration project was concluded in December, but no work was carried out on the beams. Ronald Pisani, who is the artist who made the marble altar in 1989, said that the front part of the altar is at least three-fourths lost. 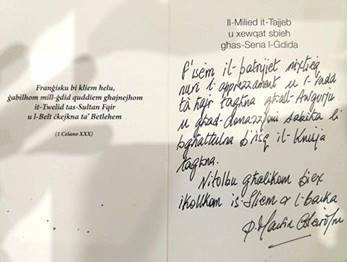 Archbishop Mgr Charles Scicluna expressed his solidarity with the Franciscan Friars who run the church, which was built in 1500 and enlarged in the 18th century. He later visited the church. As soon as this unfortunate accident was announced, the Order of Saint Lazarus informed its members that donations will be collected to aid and assist the Franciscan community in their restoration costs. These donations were given this year and it is promised that donations will also be given during 2018.